CRM Selection in 4 (Huge) Steps – Resolv Inc. If you are looking to implement a CRM system for the first time, or replace your existing CRM system the process is the same. However, the process is very different from the purchase of any other software system in your organization, so throw away your template for an RFQ and roll-up your sleeves, since this will take some effort on your part. At a high level, the process is simply this: CRM selection starts with defining a CRM strategy, that strategy is used to develop a demo script, which is used throughout the demo review/software selection process. Each of the steps is critical for the successful selection and implementation of a CRM system. By strategy I don’t mean what features and functions you want. I’m not talking about nice-to-haves. CRM strategy defines the core belief system of your organization. The ultimate goal is for CRM to be the company culture related to customers and prospects. This strategy looks at your company mission, goals, culture, processes and people. 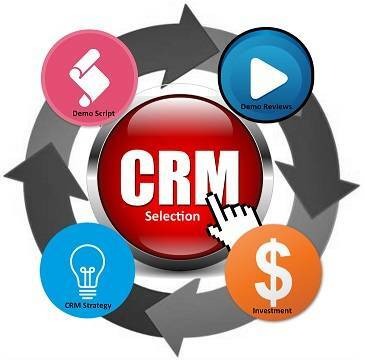 It concludes with a definition of how a CRM system will be used. Rather than issuing an RFQ with hundreds of questions, all of which will most likely be answered “yes,” ask potential vendors to perform demos based upon a script. This script helps to ensure that each vendor and CRM system you demo is being compared equally. Since this script is unique to your specific needs, it starts with providing a high-level overview of your company’s CRM strategy. This script starts with the strategy and then drills down into the details of how to accomplish given tasks in the CRM system. Now that your strategy is secure, your script is created, and your vendors are lined up, it is time to review CRM systems. You will have done everything up to this point to ensure that you are comparing apples to apples, so during this process you will be watching and asking questions related to your process, culture and goals. A CRM demo should not be a review of wiz-bang features and functions, but a demonstration of the CRM systems ability to align with your process and goals. The key thing is how closely each CRM Demo follows your script. If the script isn’t followed, is there something wrong with the software or the vendor’s understanding of your needs? Finally, it’s time to review investment options. While we may not ask every vendor/CRM system for a quote, the final two or three will be required to provide investment information. The goal of this process is to compare apples to apples again. Each quote will be unique, and it is critical that you understand all associated costs from the upfront investment to all associated and recurring costs. Ultimately you will want to compare the investment options for each CRM system side-by-side detailing all costs by category and with a 3 to 5 year cost outlay comparison. This is a process that will take more than a week. In fact, just the CRM strategy step can take months, but it is months of work well spent. Because if you know where you are going and what you want, you will vastly increase your odds of success in selecting and implementing a CRM system. There is a saying in Nicaragua which applies here; roughly translated it is “beginning cheap will end expensive.” The investment you make in time and resources prior to the software demo process will determine success. As I said earlier, I will break down each of the four steps in greater detail in the coming weeks. In the meantime, please comment with questions or observations that you may have related to your CRM software selection, or send me an email to schedule a call to discuss your unique situation.